We invite you to be our VIP guest at AntwerpXL. Taking place 7-9 May 2019 at Antwerp Expo, this event is putting the logistics of breakbulk, RoRo and heavy lift back at the heart of the conversation. 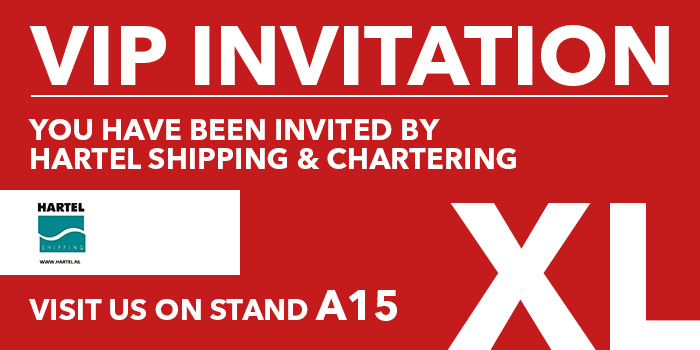 Please visit Hartel Shipping & Chartering on stand A15 to see what we can do for your business. As our VIP guest, you will receive exclusive access to the VIP lounge for refreshments and light bites, an invitation to evening networking events, free access to the full 2-day content programme , and a VIP invitation to bring a colleague. We hope to see you 7 – 9 May at Antwerp Expo.